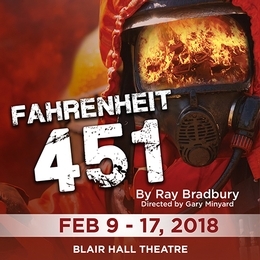 The classic novel by Ray Bradbury brought to life and reminding us that books are at the soul of knowledge: “They just might stop us from making the same damn insane mistakes!" Fri., Feb. 9 – 8 p.m. Sat., Feb. 10 – 8 p.m. Sun., Feb. 11 – 2 p.m.
Fri., Feb. 16 – 8 p.m. Sat., Feb. 17 – 8 p.m.
Thursday/Sunday performances ASL interpreted ALSO Saturday Feb. 10.